These volcanic hotpots span the length of California from Medicine Lake in the far northern region of the state down to Salton Buttes near the U.S.-Mexico border. Clear Lake volcanic field, in Lake County, is roughly 100 miles from both San Francisco and Sacramento. Other active sites include Mount Shasta and Lassen Volcanic Center in Northern California, as well as Long Valley Volcanic Region near Mammoth Lakes, and Coso Volcanic Field, east of a string of unincorporated communities along Highway 395. The report, titled "California’s Exposure to Volcanic Hazards," was compiled by the USGS California Volcano Observatory in collaboration with the California Governor’s Office of Emergency Services and the California Geological Survey. Based on records of volcanic history, geologists calculate the chance of an eruption in California over the next 30 years at 16 percent. For comparison, scientists have pegged the 30-year probability of a major earthquake in the Bay Area along the San Andreas Fault at about 22 percent. Jessica Ball, a geologist with the California Volcano Observatory and a co-author on the report, says many Californians aren’t aware of the possibilities of a volcanic eruption in the state. Volcanoes operate over longer timescales, she said. 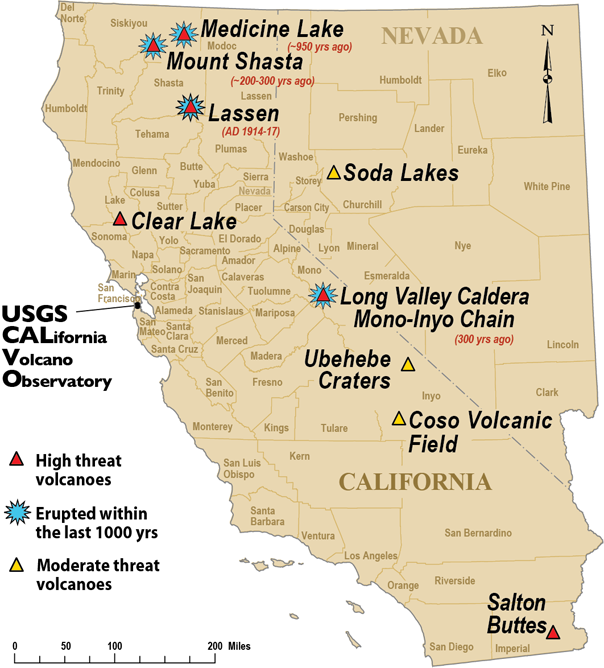 The last series of eruptions in California occurred from 1914 to 1917 within the Lassen Volcanic Center, with an explosive eruption of Lassen Peak on May 22, 1915. Lava flows, hot ash, mudslides and avalanches resulting from the eruptions had major impacts on the surrounding region. The purpose of the report, which was requested by the Office of Emergency Services, was to compile scientific knowledge about volcanoes in California and outline the major hazards that could result should one erupt. “Each volcano has its own hazards,” Ball said. Medicine Lake, for example, could face lava flows. 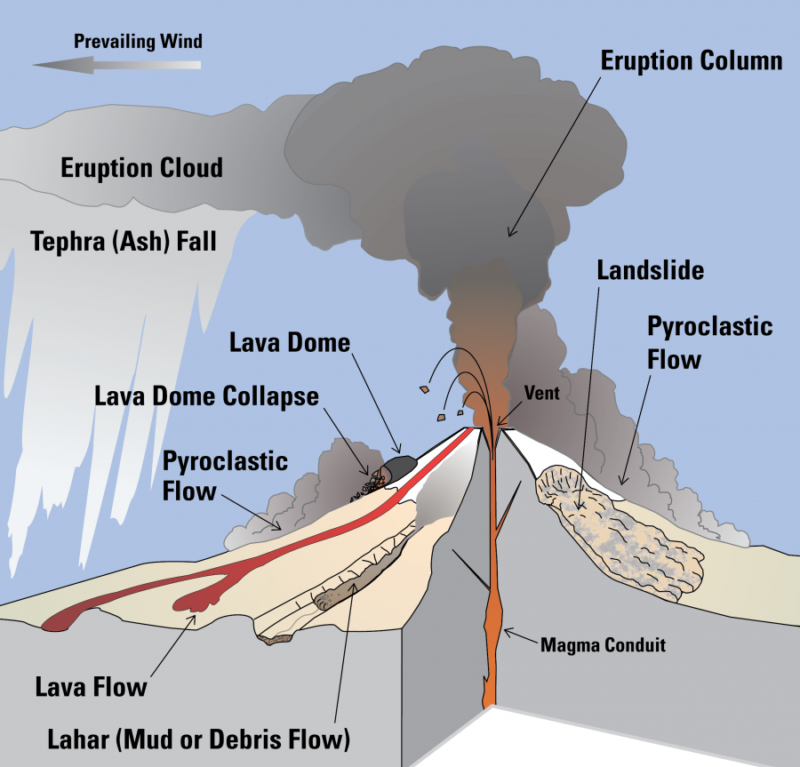 Whereas the Lassen region should be more concerned with lahars (mudslides) or high-speed "pyroclastic flows" of ash and lava powered by pressurized gas, which are a main cause of eruption-related fatalities. The urban areas that stand to be most affected are around Mount Shasta, where over 100,000 people live, work or travel within the hazard zone daily. Redding, in particular, lies relatively close to all three of the active volcanoes in far-northern California. Mount Shasta last erupted in 1786. An eruption of Shasta, according to Ball, could result in a range of hazards with varying severity. Volcanic ash clouds, for example, might pose a threat to air quality, flight patterns, road conditions, and water supply. Depending on the location and nature of the eruption, lava or pyroclastic flows could warrant evacuations. “What we’re hoping is that our partners — land managers and emergency managers and decision-makers in the state — will take the information that we provided and start making their own plans for how to help people deal with these hazards,” Ball said. Public Information Officer Shawn Boyd of the Office of Emergency Services says the agency incorporates the threat of California's volcanoes into their emergency response planning. Reports from USGS and the California Volcano Observatory are used to inform the state's Volcano Preparedness Plan, which is part of California's greater emergency plan. "We look at the volcanic hazards in California the same way we do at any other disaster," Boyd said. Cynthia Pridmore, a geologist with the California Geological Survey who also contributed to the new USGS report, says it's key for local agencies to stay informed about volcanic activity the same way they do for earthquakes, tsunamis and other dangers. For the general public, she says, the report is a chance to get prepared. "If you’re in one of these regions, it’s just another reason you need to have one of those to-go kits." Volcanic activity in California is monitored by the Volcano Observatory n Menlo Park. Up-to-date information on all seven of California's active volcanoes is available on its website. In the event of an eruption, observatory will issue alerts and report to Cal OES to initiate emergency protocols along with local counties. “We don’t want [people] to get scared," Ball says. "We’re not talking doomsday scenarios. We just want them to know that these hazards could happen sometime in the future and that they might be called on to make decisions about their safety and their livelihood."